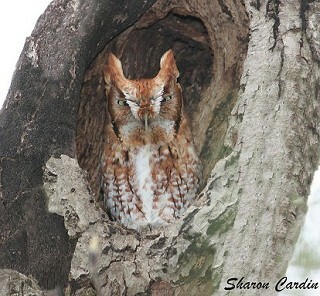 The Eastern Screech-Owl is a small, nocturnal woodland owl with ear-tufts. Its song is a distinctive trill and descending whinny that does not sound like the typical hooting of an owl. This owl has two color-morphs, reddish-brown and gray. In Tennessee the red morph outnumbers the gray by almost two to one. No other North American owl has such distinctive plumage differences. The Eastern Screech-Owl is non-migratory and occurs east of the Rocky Mountains from the Canadian border to northeastern Mexico. It is found in urban as well as rural areas and readily nests in nest boxes. Like most owls, it is more often heard than seen. Description: The Eastern Screech-Owl is a small owl, with feathered ear-tufts, and has both a reddish-brown and a gray color-morph. The toes are feathered, the eyes are yellow, and the bill is greenish. Male and female plumage is similar, the female is larger, but the male's voice is lower-pitched. Voice: Eastern Screech-Owls give both a trill on one note, lasting up to 3 seconds, and a descending wavering whinny-like song. These songs are usually uttered separately. The Northern Saw-whet Owl is smaller, with a black bill, white streaking on light brown crown. This owl nests locally in east Tennessee, and (nocturnally) migrates across the state, although rarely detected. Habitat: Found in most habitats with trees, including urban and suburban areas. Prefers deciduous to coniferous forest and riparian woodlands. Diet: Insects, crayfish, earthworms, songbirds, rodents. Nesting and reproduction: Egg laying peaks in late March and early April. Clutch Size: Usually 3 to 4 eggs, range from 2 to 6. Incubation: The female does most of the incubating, which lasts 26 days. Fledging: Both adults feed the young. They leave the nest at about 31 days and are dependant on the parents for up to 3 more months. Nest: Nests and roosts in cavities that are either natural, excavated by a woodpecker, or human-made nest boxes, including Wood Duck boxes. They add no nesting material to nest cavity. Next Box Instructions here. Status in Tennessee: The Eastern Screech-Owl is the most numerous owl in the state. It is found at lower elevations and considered fairly common throughout. Best places to see in Tennessee: Like most owls, they are rarely seen, but can be found in most second growth forest statewide. Gehlbach, F. R. 1995. Eastern Screech-Owl (Otus asio). The Birds of North America, No. 165 (A. Poole and F. Gill, eds.). The Academy of Natural Sciences, Philadelphia, PA, and The American Ornithologists' Union, Washington, D.C.